Now there's a brand new Worksman Cycle for families that know how to have fun. Family Chariots are like personal pedicabs. A Pedicab for the healthful, environmentally sensitive, progressive family. One driver can pedal others around in style! For those purely practical people, this is a great way to transport family members on short trips economically and fuel free while getting great exercise. For those looking for just plain family fun. What a trip! 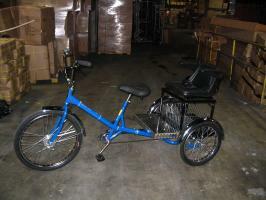 The tricycle features the heavy duty Worksman Stretch Mover Design with rear captain seats and fold down armrests. This beautiful, durable Three-wheeler is ideal for parents to ride with their younger children behind them. Super Sturdy with Drum Brake and THREE SPEED Coaster Brake. FUN, FUN, FUN!!!! 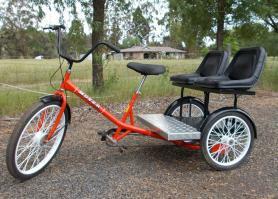 This wonderful trike is ideal for parents to ride with a passenger behind behind them. Super Sturdy with Drum Brake and THREE SPEED Coaster Brake. FUN, FUN, FUN!!! !